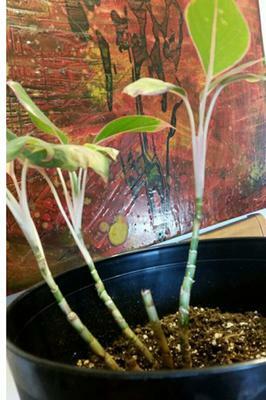 This plant needs help but what is it and what care does it need? 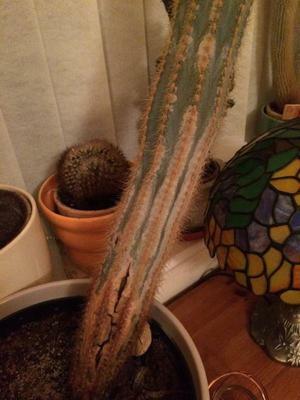 Older cactus was repotted and now seems to be dying. brown and splitting. Sorry I can't help with the ID on the cactus, they're just not my thing - however, if you overwatered it after repotting, this would explain the issues. This may just delay the inevitable, but it will give it the only chance of recovery. Unfortunately, if it's hollow inside, this means it done. 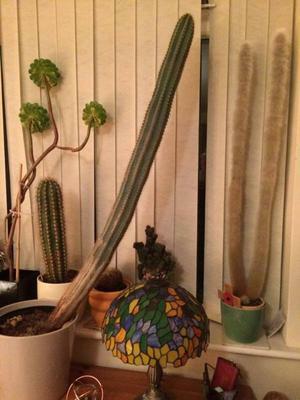 The only other option you have now is to cut the top off, to just above the damage, and try to root it. Let it callous for several weeks, on top of some dry cactus soil. Then dibble a hole and set it upright in the soil. When you tug on it, if it's got roots, it won't move (wear gloves for this, or wrap it in several sheets of newspaper). Once it has some roots, spray very lightly close to the stem. Don't water it thoroughly until it's really established. Then give it one good drink, then not again for at least six months - seriously. These plants don't need watering all the time. And, as I've said so many times, more light! Thanks. I just can't seem to get the light right. I am going to get some grow lights per your suggestion. Good call, Mary! You'll find it makes such a difference.